Most wanted and awaited feature in whatsapp now available for users in India. 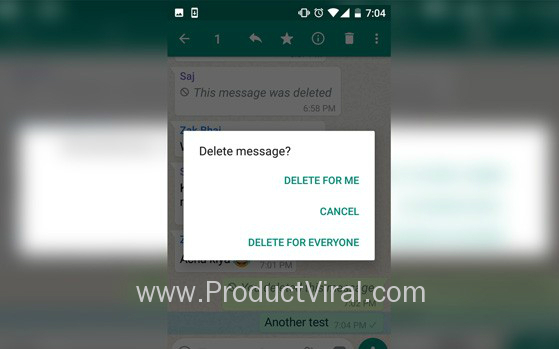 The recall message, officially called Delete For Everyone, is now available to most WhatsApp users in India. The feature that started rolling out on Friday morning is now seemingly reaching almost everyone. And the best bit about it is that you don't have to necessarily update WhatsApp to get it. The feature, as its name suggests, enables a user to "recall a message" by deleting it. In other words, as soon as you delete a message in a chat window, it also gets deleted from the phone of the person who had received. However, there is a limit to it. You can only delete the message within 7 minutes of sending it. If you try to delete a message after 7 minutes, you won't be offered option to delete from everyone's phone. -- In a chat window select the message or messages that you want to delete. It is important that the messages must have been sent in the last seven minutes. -- After selecting the message, tap on the recycle bin (the round bin) on the top of the chat window. -- You will be presented with three options: cancel will send you back to the chat window, delete for me will delete the message from your phone, delete for everyone will delete the message from everyone's phone. -- Once a message is deleted, instead of the message you will get to see "This message was deleted" in grey text. If you have deleted the message, then you will see "You deleted the message". The feature is pretty cool. But do understand that it has some limitations. It will allow users to delete a message that they wrongly sent to some chat window or something that they sent but immediately regretted. It won't allow you to delete a message that the drunk you sent in the night in morning when you are sober and realised your mistake after the re-reading the message. As noted earlier, WhatsApp users will only have a window of 7 minutes to recall or delete a message. It is also worth noting that you won't be able to delete any message that you forwarded, or in other words a message that is in quotes. It is also important to realise that even if you deleted a message that doesn't mean it wasn't read. It is possible that before you deleted a message, it was read, and it is also possible that it was screenshoted. ASUS Z2 Poseidon 6GB RAM, 256 GB Internal, 6000 mAh Battery and More ....!! !